Do you have an hour? That's all you need for this easy project. Sheets of clay tinted with alcohol make the most beautiful bracelets. If you are not a clay crafter, have no fear. You do not need clay tools to create these bracelets. Zoom to the bottom of this page where I'll tell you how to use everyday supplies in place of clay tools. 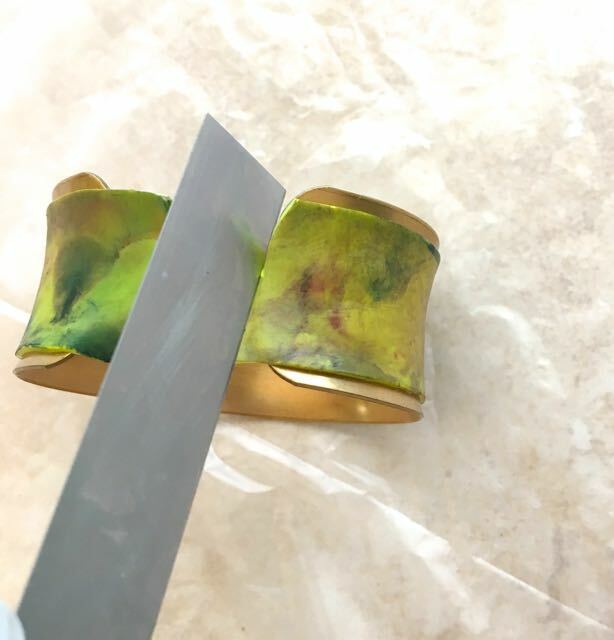 Unlike my recent tutorial for Liquid Clay and Alcohol Ink Bracelets, the following tutorial gives instructions for working with solid polymer clay and alcohol ink. Very much like my Ink and Clay Spoon Earrings, the results of staining the clay are completely random but also can be controlled. That sounds contradictory but I'll explain that in the steps below. Wearing plastic gloves, you can actually move the ink around as if you were finger painting. I've never had so much fun with ink and clay. I guess that explains why I've created more than two dozen projects with this technique. Somebody stop me. I may have to start an Etsy page! step 1 - Roll wasabi clay on the #4 setting of the conditioning machine. Cut a strip of paper 7/8" wide or about .50" less than the width of your metal bracelet form if you use a different one. The strip should be 1" longer than you need to allow for fitting the form and handling the clay ends. step 2 - Squirt red and blue alcohol ink on a ceramic tile. Mist the ink with just a bit of pure alcohol. step 3 - Wearing plastic gloves, place your clay strip face down on the wet ink. With your first contact, the ink colors may be lighter than you like without enough definition - almost watered down. Wait a few seconds. The alcohol will begin to evaporate. Place the clay on it again and you will see very different results - deeper color and more effects. You can have complete control. If you don't like your results at any time, spray alcohol on the clay and dab at it with a paper towel to remove ink. You can continue to adjust colors and placement by doing this. step 4 - You can also control color placement by spraying alcohol on the tile, touching your gloved finger to it, then rubbing across the clay to blend colors. Dab at the clay with more color from the tile to create the mix you like. step 5 - When you're finished with your project and the ink dries on the tile, keep it for future projects. Alcohol ink is pricey but it does go a long way especially if you save remnants like this. To reuse, just spritz with pure alcohol to make it fluid and reusable. step 6 - Allow the ink on your clay strip to dry completely. 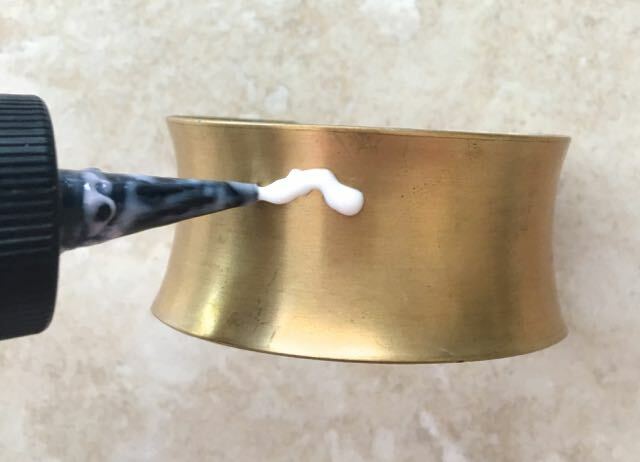 Apply Bake and Bond to the bracelet form. Do not use thick applications or spread it close to the edges of the metal. It will spread on its own as you lay down the clay strip. step 7 - Place the center of your clay strip to the center of the metal bracelet form. Smooth the middle of the clay to the form all the way to the back bracelet edges. Check to be sure any bubbles between the two layers are smoothed out. step 8 - Using a blade, push against the edge of the metal form to cut away excess clay. step 9 - With your bare fingers, smooth the clay edges around the top and bottom of the form. step 10 - Using a fine brush, apply gold ink in an irregular pattern. If the lines of the ink are too defined, dip the brush in pure alcohol, blot slightly and blend the ink edges with the brush to diffuse the lines. Use a light touch when applying the metallic ink so you don't dilute the underlying colors. step 11 - Bake the bracelet in a 275 degree oven for 30 minutes. Allow it to cool completely. The finished project can be lightly buffed with a Dremel or other buffer, or coated with a glaze. The intro to this page talks about conditioning clay with a conditioning machine before beginning. That just means blending the clay. One of its ingredients is plasticizer. It's important that the plasticizer is spread evenly throughout the clay. This will prevent your baked project from cracking or doing other unpredictable things. If you don't have a machine, roll out the clay with something round, like a metal or plastic rolling pin from the dollar store. Work on a ceramic tile or other smooth surface. Don't use a rolling pin that you've used on clay for food preparation. Roll the clay in one direction, fold it over then roll it in the opposite direction. It should take 20 rolls or more. You will feel when it is ready to work with because it will sheet nicely, feel soft and will be very pliable. You can substitute a craft knife wherever a blade is called for in the above steps. Cut the strip from your thick clay. To roll the clay to equal a #4 setting on the Sculpey conditioning machine, align two long strips of 65 lb. card stock along both sides of your clay. The strips should consist of four layers of card stock each to create the proper thickness. Staple the ends to hold them together. Tape the strips to your work surface to prevent them from moving. With your roller ends on the white strips, gently roll across the clay until it is the thickness of the card stock. If the long clay edges spread over the card stock, trim them again and roll again. Use the craft knife to trim the thinned clay strip to the appropriate width. Got ink stained clay scraps? Don't throw them out! Conditioning them will blend the ink colors into one solid shade which can be used again to apply ink designs. Many patterns can be created with alcohol ink depending on how you set the clay onto the liquid. Experiment with scraps before beginning your project. 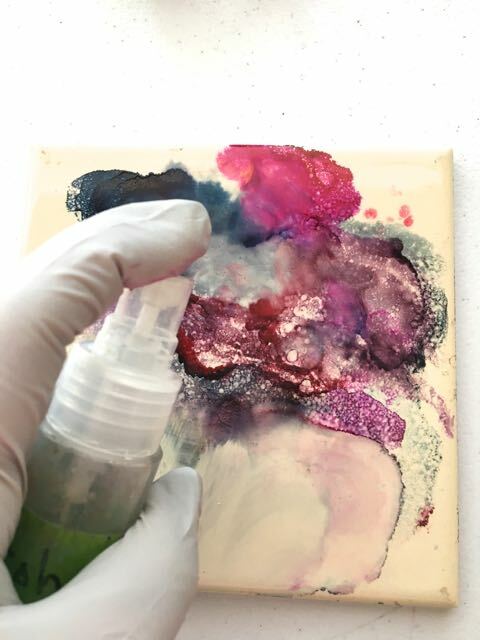 If you create a color combination you don't like, you can remove or alter it by spraying the tile with plain alcohol ink and placing the clay face down onto it and swirling it around. Piñata metallics require thorough mixing so be sure to shake the container until you hear the mixing ball working inside. Utensils used for clay should not be used with food.